Preheat oven to 350-degrees. Grease a non-stick doughnut pan with cooking spray. Measure out the milk in a liquid measure and add vinegar to curdle the milk, then add vanilla. In the bowl of the food processor, combine all the dry ingredients with the pecans and blend until the nuts have been pulverized and the mixture is uniform. Add the coconut oil and pulse to blend evenly. Slowly pour in the liquid to blend it into the dry ingredients and immediately spoon the mixture into the prepared doughnut pan. Bake 13-14 minutes and remove the pan from the oven, carefully loosen the doughnuts and turn them over in the pan. The middles may have baked over the hole section of the pan, but carefully just press them back down into the pan. This crisps up the bottoms and gives them a better doughnut form. Return them to the oven and bake another 5 minutes. The doughnuts should feel firm to the touch. Allow to cool a few minutes in the pan and then remove to a cooling rack. 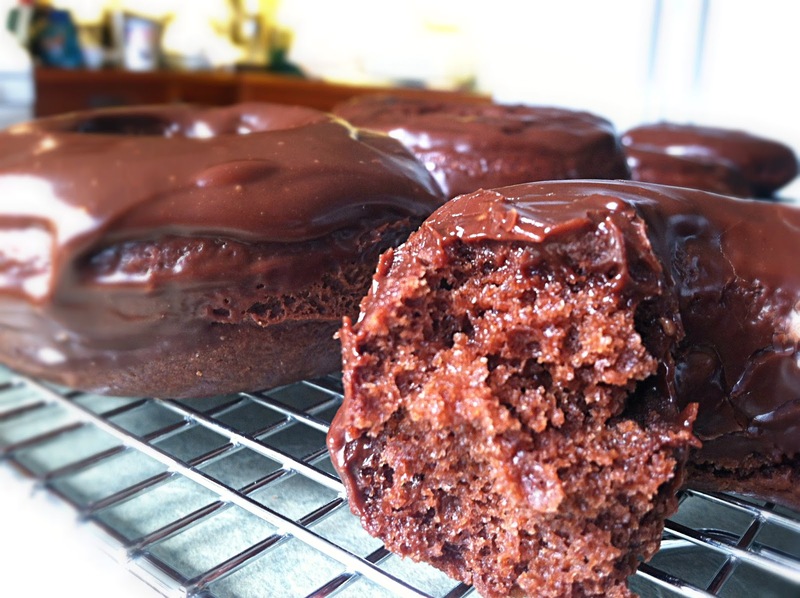 Chocolate Frosting: This makes a very small amount of frosting, exactly enough for a thin coat on 6 doughnuts, if you want a thicker frosting double the recipe and double dip each doughnut for a second coating. Microwave frosting ingredients in a microwave safe bowl 20-30 seconds. Stir until smooth and lightly frost each doughnut while still a bit warm, simply dip them tops down (the tops to me are the part that started out as the top when they first went into the oven) into the glaze and allow them to dry on a cooling rack.